Found on Occupy.com, credited as originally appearing on AlterNet. As the summer’s vicious campaign season rolls on, there’s one thing both sides agree on: the 2008 mortgage crisis is still frustratingly unresolved. Last week, Citigroup settled for nearly $600 million with its shareholders over allegations of deception, the latest in a continuous string of lawsuits that has implicated almost every single major banking institution since 2008, but not led to a single criminal conviction. 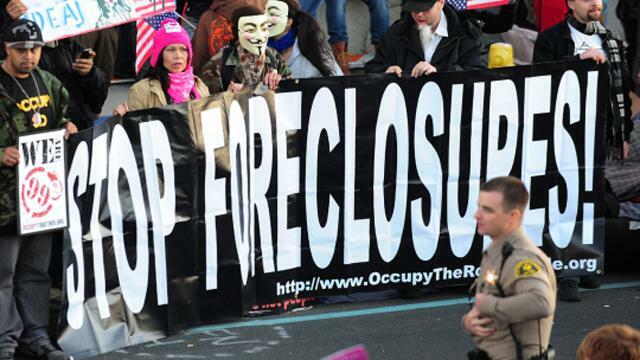 Headlines throughout the summer alternated between declaring that the number of foreclosure filings are rising and decrying that banks had defrauded the government’s mortgage modification program in order to–you guessed it–turn a profit for themselves. With various government agencies divided on the next steps and hundreds of thousands of homeowners receiving foreclosure filings each month, it’s clear the nation has reached an impasse. In August, a new player called Mortgage Resolution Partners stepping into the fray with a controversial new idea for local governments drowning in foreclosures: use eminent domain to seize underwater mortgages and force down the loan. In other words, it’s time to ditch the carrot and take the stick to Wall Street. Depending on how you look at it, Mortgage Resolution Partners, a collection of 50 Silicon Valley investors, is either a group of well-meaning one-percenters looking to ameliorate the foreclosure crisis, or a bunch of rich vultures hoping to turn struggling homeowners into an investment opportunity. The group’s proposal is essential as follows: Counties would use eminent domain to seize the mortgages of homeowners who owe more than their homes are worth. The county would compensate the banks, using money lent by Mortgage Resolution Partners, at 80% of the house’s market value, a figure that is lower than the original mortgage but many argue is fair compensation because it calculates in the homeowner’s likelihood of future default. Once in possession of the mortgage, the county would allow a homeowner to refinance her mortgage into a new FHA-backed loan worth just under the house’s market value. The new loan would create enough to repay Mortgage Resolution Partners both the original investment and a fee. Theoretically, everyone wins: The county would have fewer foreclosures, the banks are more likely to get their loans repaid, the homeowners stay in their homes, and the middlemen Mortgage Resolution Partners turn a profit. Eminent domain gives the government the right to seize private property–both physical and intangible–under two conditions: that the seizure is for the public good and that the government pay just compensation to the property’s former owner. The power of eminent domain has occasionally been granted to community groups, such as the Dudley Street Neighborhood Initiative in Boston, but is more often used by local governments to build interstates and schools, often on land where minorities once lived. Despite its often controversial and racist history, it is one of the few legal opportunities to break private property contracts, and therefore a powerful tool for the government–and a scary threat to property owners. The fact that the use of eminent domain is on the table at all is a good indication that the conversation surrounding the continued foreclosure crisis has reached some level of sanity. For years foreclosure has been considered an individual issue that plagues only irresponsible homeowners, but the hard numbers prove displacement’s harsh systemic reality. Every single foreclosure in hard-hit areas can decrease the surrounding houses’ property values by up to 30 percent, according to the IMF, creating a downward property value spiral that has created Detroit’s infamous $1 homes. Sharp property value reductions lead to billions of dollars of losses in household savings for families who have not missed a single mortgage payment. The foreclosures also reduce the local government’s tax revenues and jack up the city’s foreclosure-related expenditures. One study estimated that every single foreclosure costs the government $2,058 in lost property tax revenue and as much as $34,000 per foreclosure in costs like eviction procedures. Multiply these government losses by millions of foreclosures since 2008, and it’s not hard to see why many local governments are teetering on the brink of bankruptcy. Yet, despite the general applicability of eminent domain in this context, Mortgage Resolution Partner’s proposal has already generated some fierce backlash. Some, to be expected, comes from a freaked-out financial industry and its lackey news agency, Fox News. But the details of Mortgage Resolution Partner’s proposal have given many left-leaning economists pause. Some worry that 80% of the house’s market value wouldn’t hold up in court as “fair compensation,” and others worry that if the plan fails, the local governments will end up having to pay the price, a risk the bankrupt counties considering the plan cannot afford to take. Still more are skeptical of a plan that offers to help underwater homeowners while ignoring those most at risk of foreclosure: homeowners who are already in default. Instead of helping homeowners who are still current on their mortgages, eminent domain could be used to help in-default homeowners avoid eviction. This idea would be less popular politically due to the stigma of foreclosure, but it makes more sense from a systemic economic analysis. Both the stakes and the reward are higher. First off, there is a much greater chance that, without intervention, the family will suffer eviction and the government will have to pay the subsequent costs. Secondly, the local governments would have a much better chance of negotiating a cheaper compensation price on in-default mortgages. Another alternative, as attorney Ellen Brown proposes, is to target the mortgages on the houses where the chain of ownership has been broken by the use of the electronic database Mortgage Electronic Registration System. More often called MERS, the registry was a central tracking system, or a dumping ground, for the title of millions of home loans. U.S. law requires physical ownership records for the transfer and sale of private property, but during the dizzying shuffle, packaging and securitizing of mortgages in the 2000s, the banks really couldn’t be bothered to dot their I’s and cross their T’s. So instead, they created MERS. The registry’s legality has been under increasing scrutiny. In mid-August, the Washington State Supreme Court ruled that lenders couldn’t use MERS to initiate foreclosure because it didn’t constitute a legal beneficiary of the mortgage note. Last week, an Oregon Court of Appeals deemed the registry an incomplete means of proving ownership, and that lenders who used MERS will have to go to court to prove ownership before initiating a foreclosure. Local government wielding eminent domain can step this ownership gray zone to acquire houses free and clear, Brown argues, because once the county announces its plan to use eminent domain, it’s up to the owner to prove ownership. And if MERS claims to be the mortgage title holder, there’s a good chance the ownership won’t be held up in court. If Brown’s plan sounds like an obscure, small proposition, it’s not. MERS claims to hold the title to 60 million loans, approximately half of the home mortgages in the entire country. Hers is a much further reaching proposal than Mortgage Resolution Partners’, which only applies to underwater homeowners that are not yet in default. Moreover, Brown’s plan threatens to actually hold the banks accountable for their blatant disregard for centuries of U.S. property law, making a powerful case that breaking today’s mortgages is not a violation of private property rights, but actually a reassertion of them. If a local government adopts either of these two eminent domain proposals, the model will be replicated in hard-hit communities across the country, meaning that the time to vet these proposals for feasibility and long-term impact is now. But one thing is for certain: using eminent domain–if correctly applied–is a step in the right direction, a move away from settlements and pro-industry subsidies and towards actual government action.